In a recent survey, it was reported that 77% of Singaporean mom want to juggle work with parenting. And for me, I belong to that 77%. 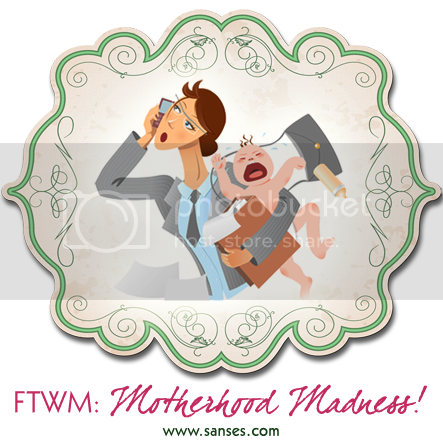 While I may not share my struggles on being a FTWM aka Full Time Working Mom much on my blog, what I go through is not unique to me as all working moms will agree that can be stressful and tough going. The topic of work life balance have been under the spotlight as the government have been racking their minds to encourage the singapore female population not to delay marriage and starting a family. In that sense, I can be considered the model citizen as I got married at 26, had my child at 29 and promptly returned after my four months of maternity leave. I often surprise people when I tell them that I work full time, have no helper, cook my meals, find time for exercise ad even have time to blog. If you’ve think that I’ve got it all together, think again. A few contributing factors what allowed me to do is because I had a pro work life balance company, supportive and hands on husband, experienced and reliable infant care centre and of course parents and in laws who were ever ready to help. If there is one thing that a lot of working mom struggle with, it’s mummy’s guilt. When we are at work, we miss out on our baby’s first milestones from their crawl, first word to first step s and it pains us that we hear about it from our parents or the care takers rather than witness it ourselves. Personally it was a huge struggle at the beginning and I even cried after I left Sophie at the infant care on her second day! Mondays are sometimes hard when neither of us wants to be at the childcare or at work. But since, I’ve decided to work, then I have to make the best of it. It helps greatly that I have fellow colleagues who are working moms themselves and we can support one another too. There are days when the stress of work and family gets to me and all I want to do is just wish myself away. These days usually happen when the projects I work on gets put on hold, delayed or worse rushed to be finished and people I have to deal with are as thick as a brick! And when I get home, Sophie is ill or when she’s more than a handful and the clothes that I have to wash and iron are staring right back at me. All these just gets my stressometer right up to a 9! But when I have much saner days, I’m also thankful that I made the decision to keep working. Working in the insurance line and having seen how anything can happen, it pays to be financially prepared for those what if situation. And if nothing happens, then we have more options. Options to send Sophie overseas, options to retire early, etc. Of course it’s not denying that having a dual income also gives us a more comfortable lifestyle where we can go for our well deserved holidays and eat at fancy places from time to time. At the end of the day, you have to decide what makes you a happy mom. For me, it’s important that I don’t lose my own identity after being a mother. Hence I decided to continue working so that I can have adult conversations, be kept relevant with my skill sets, have more savings in the bank, enjoy quiet time by myself at lunch or maybe even a date with Alexis. At the same time, actively pursuing a balanced life by doing what I enjoy like cooking, crafting and even going for leisurely runs to give myself space to think, pray and reflect. Incidentally, I took urgent leave yesterday to take care of Sophie as her child care was closed and my mom suddenly fell ill. So you see, this is the kind of curve balls that I have to deal with from time to time as a working mom. But I can deal with it. I just need some ice cream at the end of the day. Sophie in praise of mummy’s lunch! Yeah! If you’re a working mom, can you identify with some of my struggles? What do you struggle most as a working mom? I always thought your life is not easy but you always manage to survive it all and emerge victorious. =) Love it when you say it all boils down to what makes you a happy mom. =) The happier we are, the happier our kids are at the end of the day, isn’t it? =) Hope Sophie gets well soon! My struggle was to play my role as a daughter, wife and mom equally. but i know we cannot have the best of both worlds. but this never stop me from trying. Let’s jia you together! Hey Susan… hope your back is getting well… 🙂 Jiayou! I can so identify with all that you’ve mentioned… and more! There are days when I feel overwhelmed, and as we’re all aware, with a kid, we can’t really tell what might happen – no matter how we try to prepare ourselves. We just have to deal with things as they come. Take care of that back! You’re so right about the surprises that springs at us when we least expect them. This really keeps me on my toes and can be tiring especially after work when my brain feels fried. But no matter what, I’m thankful that hubby is there to lend a supporting hand whenever it’s needed. You’ve always had my respect and I always find it amazing how you manage to do all that you do in 24 hours! But like you mentioned, I’m sure life is not fine and dandy all the time. That said, you’ve got a great attitude that should see you through the rainy days! Keep it up and let’s work at it together! 24 hours a day is never enough for me, that’s why I may have mistreated my body by not giving it enough rest to recharge. Yup, can definitely identify with your struggles and guilt as a FTWM. Kudos to you for juggling it all so well though and being able to be there for your family in-between your work commitments. Hope you get better today as well.. But I do think you make it look easy – especially with your effort to exercise, and cook own meals! Keep it up! Thanks Sandra. Haha the reason why I make it look easy is because I rather not complain about the situation on my blog. Hubby will tell you that I definitely haven’t got it all together. I salute you, a mommy of three and looking calm and composed. I definitely treasure my moments with ny girl too cos u don’t have that many. I think all moms and dads struggle with this balance, which always eludes us. I’ve read and come to realize that there’s no such thing as balance, meaning you can’t give 100% to both work and home, and you can’t give 50% to both either. Sometimes it’s 100 % to one, and none to the other, or vice versa or some combo. But one always suffers more than the other. We just have to choose what suffers, and when. For me, starting out at a new job, with a young child in daycare and one on the way, my career is going to suffer and I’m ok with that. I’d rather be home at a normal hour, have dinner together. My job is also not as stressful as others’, and my manager is understanding, so that’s really really helpful. I wouldn’t give up working to be a sahm. Just not my personality, right now anyways. Maybe part time? Who knows. Thanks for leaving a note. It’s nice that you had the opportunity to experience both roles as a mom. There is no one role that is better than the other as we’re all trying to be the best mom for our kids.